For KF-91 SATA mobile rack. Support all brands of 3.5" SATA H.D.D. Suitable hard disk type 1.0? or 1.6? height 3.5? Serial ATA H.D.D. 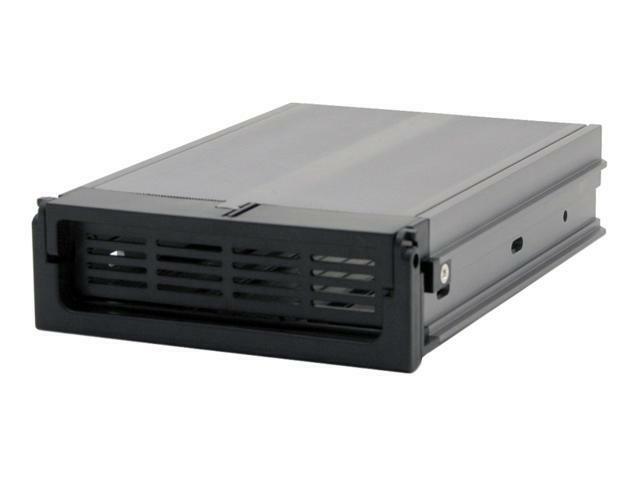 KF-91-IT-BK black aluminum inner tray for KF-91-BK serial ATA mobile rack. Aluminum cover tray for KF-91-BK mobile rack. For standard 1" or 1.6" height, 3.5" H.D.D. Support all brands of 3.5" Serial ATA H.D.D. Suitable hard disk type: 1.0" or 1.6" height, and 3.5" SATA H.D.D. Extra inner tray for KF-91 SATA mobile rack. Pros: Solid build. Aluminum keeps it cool. Top opens easily to install drive. Mine's old and still going. Cons: No frills, but that's ok.
Pros: I have several computers with these trays (plus the base caddies) from Kingwin. I buy a lot of trays...very handy when you have a lot of hard drives. Great solution, much better than my previous IDE caddy/trays made of plastic and with a locking key. Aluminum is solid, and I never liked having to fish around for a key to remove the tray. If you are the type who can't remember to turn off the computer before removing the tray, look elsewhere. Never had that as an issue. Also, the open back does allow for better air flow, cooling. Cons: None. Note that your drive and motherboard have to both support hot swapping if that's your goal. I don't do hot swapping...I just turn off the puter and pull one tray out and insert another. Other Thoughts: This tray is designed for a specific, keyless base station caddy (which contains a fan). Make sure you get the right tray for your caddy. This tray goes with the Kingwin KF-92-BK "mobile rack". Like I said, I prefer all metal and keyless. The caddy (with fan) keeps the drive plenty cool. BTW, if the fan fails on the caddy, you get a red warning light. Didn't have that with my older IDE caddies. The fans do fail sometimes or get out of round and make a whining noise. Fan replacements are easy on this Kingwin system. Pros: great for swapping hd's. I got a set of these so i can swap out drives and use different OS's without having to dual boot or run VMware. Cons: the only con i got is the keys. if you want to keep them inserted, it is a pain. i just want the keys there, when i lock the drive, they keys pop out. but what do you expect for $15? Pros: Good Construction and Quality. Easy to swap between drivies. Cons: Must use caution when swapping drives otherwise damage could result to drive base connectors rendering your hard drive useless. Other Thoughts: Kingwin should have used an external to drive docking mechinism. The hard drive connectors mate with the base unit subjecting them to possible damage. Care must be used when installing and properly aligning the hard drive. With a little care a great system. Cons: It broke at the powerconnection after only 4 months por design. Other Thoughts: Not worth it. Pros: I have been using mobile docks for many years. Now that I am switching from IDE to SATA, I needed a good solution for managing many drives containing all kinds of data, especially video archives. These trays are solidly built, and the best part is the connection to the dock is a direct SATA, no intermediately interface. That's what people are talking about with the open back of the tray. Your SATA connector and power connector on your drive go directly to a pass-through connector on the dock. Other mobile docks have you plug the drive into a small interface in the tray, which then connects to the interface on the dock. That's extra steps for the data pass-through. Cons: Drives installed in the main tower do run a bit cooler than drives in enclosed trays, even though the dock for these trays does contain a small 40mm fan. The tray is a tight space, so you don't get as much air circulation around the drive as you do with drives mounted in the tower locations. The fan in the dock could be located to a more efficient location, and you can replace the fan with a more efficient 40mm replacement (but you might get more noise). My tests show drives in the tray/dock run 3-5 degrees warmer, but still within acceptable temps according to source that say optimal drive temp is 35-40 C. Hotest I get is 40-42, but generally around 37-40 with these trays. Other Thoughts: I particularly like the dock that these trays go into. Mainly, there is NO key, just a locking turn knob. I am always looking around for the key for my current IDE drive docks, which is a hassle. The dock for these trays also has a warning light that is supposed to tell you if the 40mm fan fails. Haven't tested that yet, but plan to. Pros: Aluminum metal casing. Missing back plate helps with heat dissipation. Hooks up ok with mothership. Cons: Doesn't have a back plate - it's wide open. It looks weird like something is missing. Pros: Easy to swap, flick of a key turns on and off - regardless of the poor reviews conerning the flimsyness of the handle it works smashingly well with my daily swaps, much better than another that I use at work - with considerably less problems. Cons: Wish the original tray and bay unit came with two trays instead of one; otherwise - rock on! Other Thoughts: Given the price and pretty much brain dead operation well worht the cost.